Struck in 1oz Copper, this medal commemorates the Apollo 11 Robbins Medals that were flown on the NASA mission to walking on the moon. These will be minted for one year and the Robbins Medal Eagle image has appeared on Ike and Susan B. Anthony Dollars. 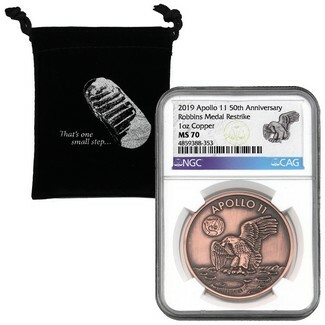 The reverse includes the astronaut’s names, as well as the date of launch, landing and return; as well as the legend 50th Anniversary and dual dates 1969-2019 to distinguish them from the original medals. This example is certified in MS70 condition by NGC and CAG (affiliate of NGC selected to certify the original medals and other memorabilia from Armstrong's estate).